The Icelandic film industry's first ever bona fide foray into in-your-face exploitation horror movie territory, Harpoon: The Reykjavik Whale Watching Massacre is a blackly comic and supremely gory affair that has led David Hayles of The Times to claim, "it's tourists versus deranged whalers in this fright flick that'll make you scream and blubber." Having recently been given a rapturously reception by a rabid audience of appreciative horror fans attending a sold out screening at the Glasgow Film Festival's Annual Frightfest, Harpoon: The Reykjavik Whale Watching Massacre comes to DVD in May 2010 courtesy of E1 Entertainment and promises to be one of the most talked about horror releases of the year. 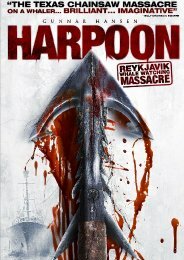 Harpoon: The Reykjavik Whale Watching Massacre (cert. 18) will be released on DVD (£12.99) by E1 Entertainment on 10th May 2010.